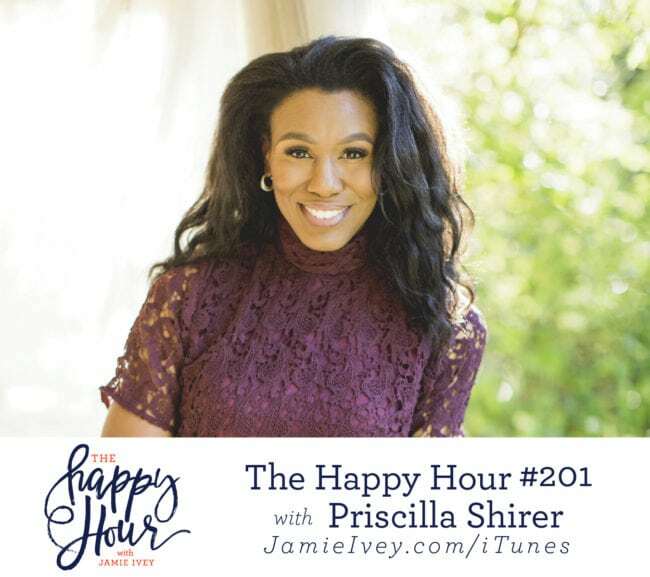 My guest for The Happy Hour # 201 is Priscilla Shirer. Priscilla is a wife, mom, and Bible teacher. She and her husband, Jerry, lead Going Beyond Ministries through which they provide spiritual support and resources to the body of Christ. They count it as their greatest privilege to serve every denomination and culture across the spectrum of the church. We start out the show talking about family and ministry - you guys have heard Chrystal and Wynter on the Happy Hour before, and it's awesome hearing how they do life together and support each other. Priscilla and I talk about trying to teach our kids the importance of those daily tasks we all need to do (i.e. cleaning, cooking!) and being ok when maybe it's not quite how we would have done it - the struggle is real! Priscilla then shares how she started writing The Prince Warriors series - can you imagine if your 4 year old came up to you and asked, "Mom, will I be in a battle one day?" This is what happened to Priscilla and you are going to love hearing what happened from that question. In the last part of the show Priscilla shares how she came to act in movies. I think we can all relate to feeling afraid, intimidated, and unequipped to succeed. But, I know you will feel encouraged as you hear Priscilla describe how God led her and made what felt impossible, possible, and expanded the reach of the ministry greater than she could have imagined. *Giveaway! * Find me on Instagram to enter to win The Prince Warrior Trilogy! *LAST chance* for Books + Brews with the Iveys tickets - Get them HERE! Prep Dish - Get your first month for only $4! Third Love - Get 15% of your first order!